For many students, the required mathematics course becomes a barrier to degree completion, either because they are reluctant to sign up for a mathematics course, or because they sign up for a mathematics course that is not appropriate for their program of study. It is important that students take the right mathematics course for their program of study or major. Ideally they should complete this first mathematics course during their first semester of enrollment. The University System of Georgia actually has four mathematics pathways, each defined by the first mathematics courses that students take in Area A2. Students majoring in science, technology, or mathematics are expected to start with MATH 1113 Pre-calculus or MATH 1112 Trigonometry in Area A2. Students majoring in engineering (and all Georgia Tech students) are expected to start with Calculus in Area A2. Non-STEM majors have a choice of taking MATH 1001 Quantitative Reasoning, MATH 1101, Introduction to Mathematical Modeling, OR MATH 1111 College Algebra (or a higher mathematics course) in Area A2. Up to now, the default for non-STEM majors has been MATH 1111 College Algebra. Academic advisors have tended to advise students into MATH 1111 no matter what their major, seeing this as a “safe choice” that can apply to any major. The problem is that it really isn’t a “safe choice.” MATH 1111 has a very high withdrawal or failure rate, and for many students it becomes the singular barrier to degree completion. In addition, while MATH 1111 could be part of the pathway for STEM majors, STEM majors are supposed to start with MATH 1113 Pre-Calculus or Calculus in Area A2, so students who would need to start in MATH 1111 are already a step behind as STEM majors. The Area A2 alternatives to MATH 1111 College Algebra for non-STEM majors are MATH 1001 Quantitative Reasoning or MATH 1101 Introduction to Mathematical Modeling. Most institutions only offer one of these two courses and no institution is required to offer both. Regents Advisory Committees were asked to evaluate which of the non-STEM mathematics pathways was most appropriate for their students. In considering this question, they were asked to weigh most heavily whether or not calculus was required to complete a program of study in the discipline, and to recommend whether students should take MATH 1111 or one of the two alternative courses, MATH 1001 or MATH 1101. It is important to note that these “alternative” courses are not “algebra free.” They are rigorous mathematical courses that incorporate essential algebra skills for non-STEM majors in an appropriate context. Students who are not STEM majors may not be REQUIRED to take a particular mathematics course (from among MATH 1001, 1101, or 1111), and may choose to take MATH 1111 even if MATH 1001 or MATH 1101 is recommended for their program of study. Selection of mathematics courses for non-STEM majors is a matter of advisement, not a matter of degree requirements. All students are also free to take higher level mathematics courses if they place higher than MATH 1001, 1101, or 1111. The Regents Advisory Committee on Mathematical Subjects (ACMS)4 issued the general course descriptions below to aid Regents Advisory Committees in recommending the appropriate Area A2 mathematics course for their program(s) of study. Links to more extensive descriptions of course content are also provided. This course is the first step in the pathway to a calculus course. 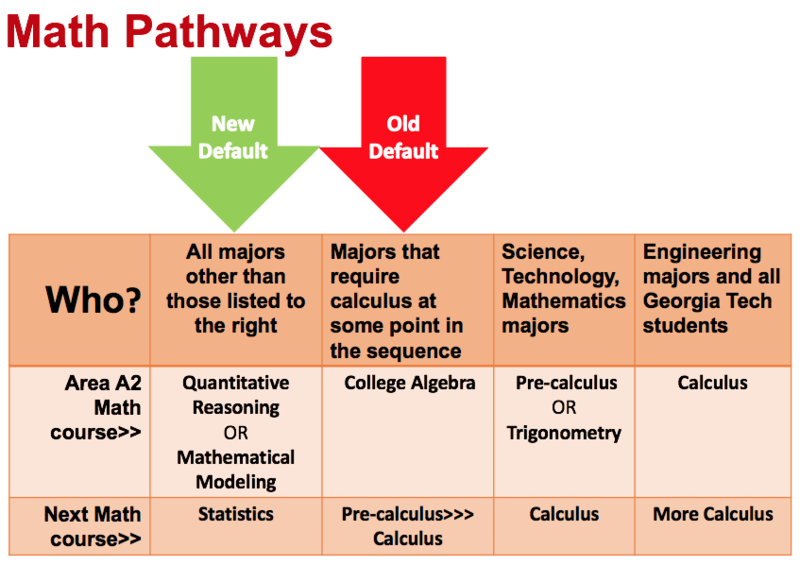 In general, students should not be entered in this pathway unless it is a prerequisite for a major requirement (either in mathematics or elsewhere). This course was designed explicitly to develop the algebra skills needed for success in calculus. Students who will not need these specific skills in a later course are usually better served in the other pathway. The next step in this pathway could be trigonometry, pre-calculus, or a survey of calculus. Individual institutions in the USG typically offer only one of these courses. Both courses include the analysis of data–centered problems with the intent of developing appropriate mathematical models and communicating results in a clear and effective fashion. The difference between the two courses is that 1001 places more emphasis on decision making in the context of problem-solving while 1101 places the emphasis on modeling real-world data with elementary functions. Possible next steps in this pathway would include courses in statistics, or further courses in mathematical modeling or decision-making. 4 Advisory Committee on Mathematical Subjects (ACMS), MATH Pathways in the University System of Georgia. A Meaningful Math Requirement: College Algebra or Something Else?